“The way you look influences the way you feel and the way you feel influences everything”. The Makeup Room is a high profile and fully mobile service that specialises in Bridal and Special Occasion Hair and Makeup. Owned and operated by Tracy Bradley, an award winning Bridal Hair & Makeup Artist based in Melbourne. 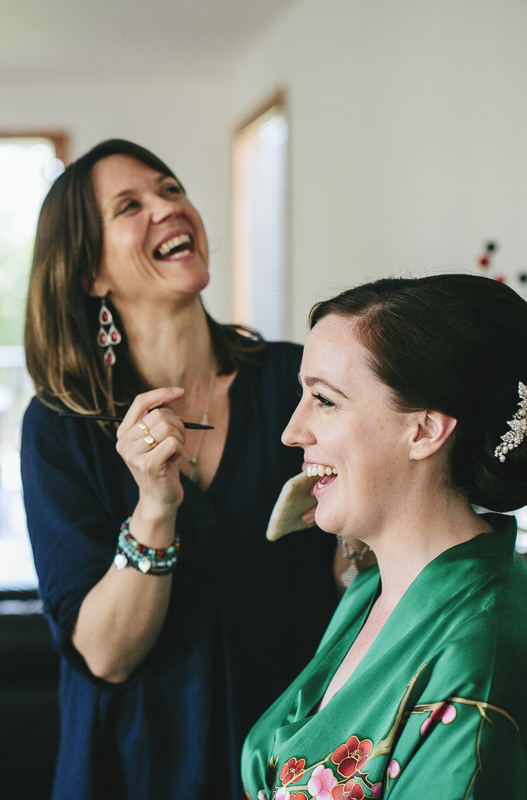 Tracy is a full time professional Hair and Makeup Artist with over 25 years’ experience. Her work has graced the pages of magazines, appeared on runways and television programs, and hundreds of advertising campaigns. Her professional work can be viewed at tracybradley.com.au. Working with thousands of people over her career from celebrities, sports stars, and models, to other high profile identities, politicians and more, Tracy’s diverse experience, ability to identify with others and intuitively know what’s required sets her apart from many others in the field. Her experience, passion, enthusiasm and calming nature, make all her clients feel completely relaxed and beautiful on their special day. Tracy’s hair and makeup work is immaculate. Her style is all about making ‘You’ look like ‘You’. Working with your natural features and finding out who you are, means she can bring out your best. Her caring nature and interest in people ensure that all her wedding client’s still look and feel themselves. Tracy uses only high quality products to make sure your signature styling lasts all day and night. “I always recommend my clients look after their skin and hair leading up to a wedding day, so guiding you the right way is extremely important”. She is meticulous about the way she works with you. Recommending other services like hair and beauty salons, products you can use, scheduling in trials, assigning other artists if she is already booked or you require a team and consulting you in the lead up to your day; these are all part of the service. All clients can rest assured that their day will be stress free as everything is considered. Tracy and her team will travel to all Melbourne suburbs and many locations throughout Victoria and Australia. Tracy is also the founder of ProArtists Australia (website coming soon), a boutique agency of personal makeup trainers and teachers, for the sole purpose of teaching the individual how to achieve their own makeup results. Dear Tracy, Just wanted to say a massive thank you for doing my hair and makeup on Saturday!! I felt amazing and am so grateful for all you did. My bridesmaids also felt amazing! Hi Tracy. I just wanted to say thanks for everything! Ian and I had a wonderful day and I was so happy with the way everything turned out. You and Lauren were amazing and made us all feel very relaxed and beautiful on the day. I have had so many compliments about both of the hairstyles and makeup. I couldn't have been happier! Thanks also for the beautiful photos. You are a woman with many talents. Have a lovely Christmas and new year. Dear Tracy. I wanted to say a huge thank you for your support in making our wedding such a success. I was so happy with my hair and makeup and had so many compliments on the day. Lisa Gowing even emailed me saying how much she loved my “entire look” and the bridal party as well. I’m pretty laid back and didn’t really know what I wanted or what would suit me, so I love that I was able to put my trust in you and go with it! I couldn’t have been happier. My hair and makeup was perfect all day, right until we left (which was when our guests did as well at 12.30am!) Thanks again!! Dear Tracy. Thank you so much for making me and my girls look so beautiful! We had so much fun getting ready with you & Bec. I had so many compliments on my hair & makeup (including my lush lashes!) and I felt so glamorous yet entirely myself, thanks to you. Dear Tracy. In all honesty, I cannot thank you enough for being there on my wedding day. you went above and beyond, and I felt amazing. There is a reason why you are in such high demand and that is because you are the ultimate professional whilst being incredibly warm, friendly and just a beautiful soul. I would not hesitate to recommend you; in fact I cannot recommend you highly enough! Thank you for everything- you truly "made" the experience on my day. Each year the ABIA host ‘5’ State Annual Bridal Industry Awards across the country, attracting between 250 – 350 Wedding Industry Professionals at each event. All ABIA Winners & Finalists are determined solely based on the ratings provided by the Past Brides & Grooms of Australia – each year the ABIA Awards Program receives 25,000+ Wedding registrations, which are invited to rate & review their wedding vendors in the Quality of Product, Quality of Service, Attitude of Staff and Value for Money. The ABIA further hosts its highly estemeed awards each year, the National Designer of Dreams Awards; a true representation of business which encompass consistent proficiency and excellence. All business which qualify for the National ABIA Awards have been nominated over a 4 consecutive year period, achieving an average rating above 98% with its past Bridal clients.